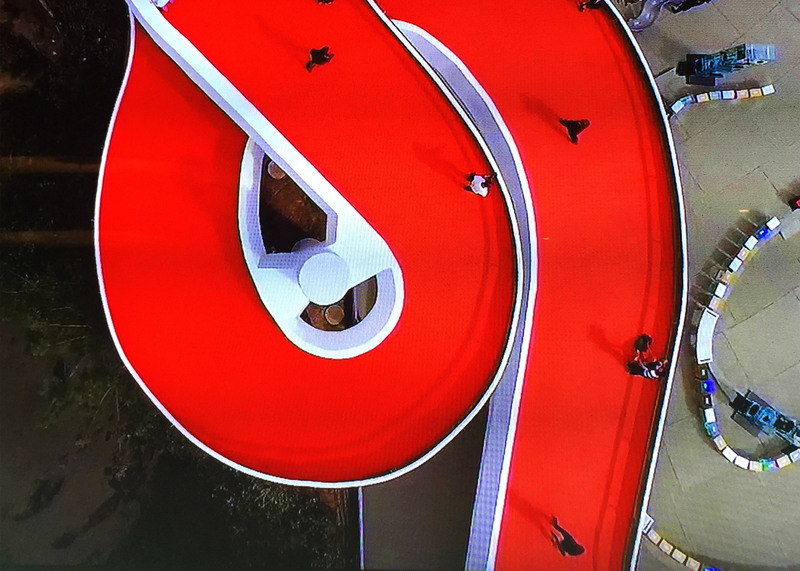 British set designer Es Devlin has created a twisting pathway around the Oscar Niemeyer-designed Museo de Arte Contemporáneo de Niterói for the Louis Vuitton Cruise Collection catwalk show (+ slideshow). Devlin collaborated with Louis Vuitton's creative director, French fashion designer Nicolas Ghesquiere, to create the set for the brand's recent show in Brazil. 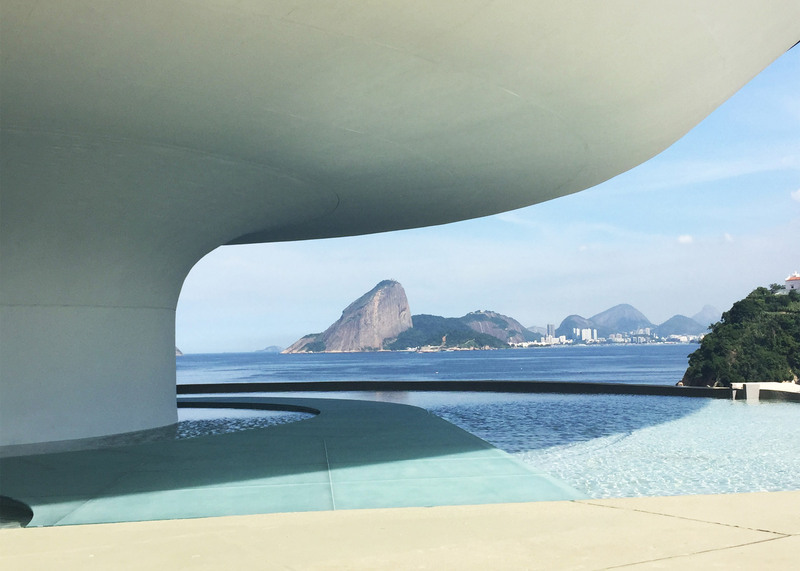 The duo chose the contemporary art museum by legendary Brazilian architect Oscar Niemeyer in Niterói, Rio, as the setting for the event, which showcased Louis Vuitton's annual ready-to-wear cruise collection. "We conceived an environment in direct response to Niemeyer's ground breaking futurist architecture and to the extraordinary urban and natural geography that surrounds it," said Devlin. 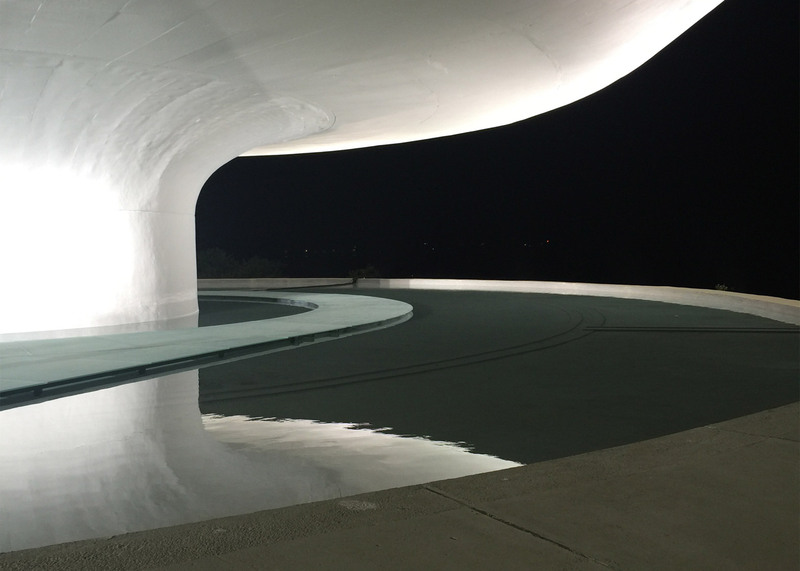 "The protagonists of the show treat the Niemeyer museum as an observatory to the future," she added. Models walked along pathways that meandered along the museum's twisting access ramp, through permanent concrete benches and temporary seating in its forecourt, and then around the bottom of the circular building. 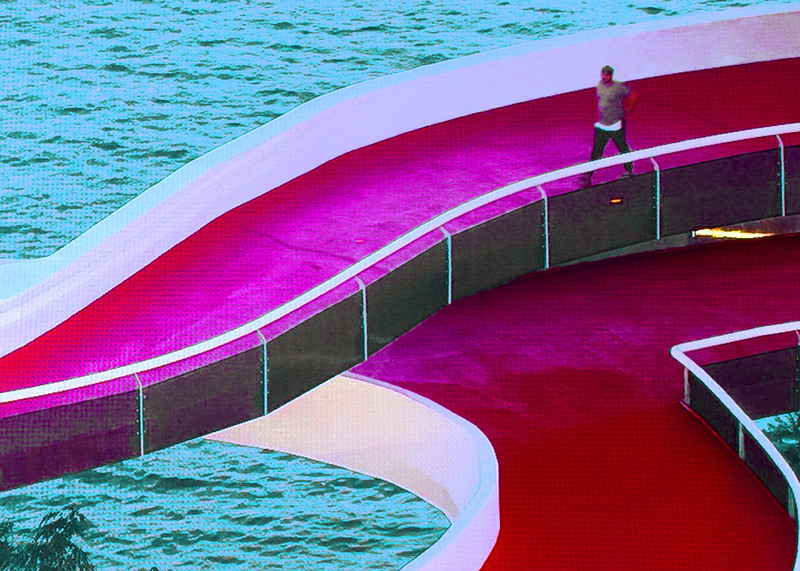 The floor of the catwalk along the museum's ramp was covered with a red textile, in reference to its pigmented concrete, while pale blue was chosen for another section that passed over a pool of water at the museum's base. "The pathways they trace echo its sinuous linear forms and guide our eyes towards the depths of sea and rock scape beyond," said Devlin. Devlin said she designed the colourful plywood, glass and perforated steel seating as a response to the Carioca spirit of gambiarra. Carioca refers to anything related to Rio de Janeiro and its surroundings, while gambiarra is described as "the art of transforming the available into the essential". 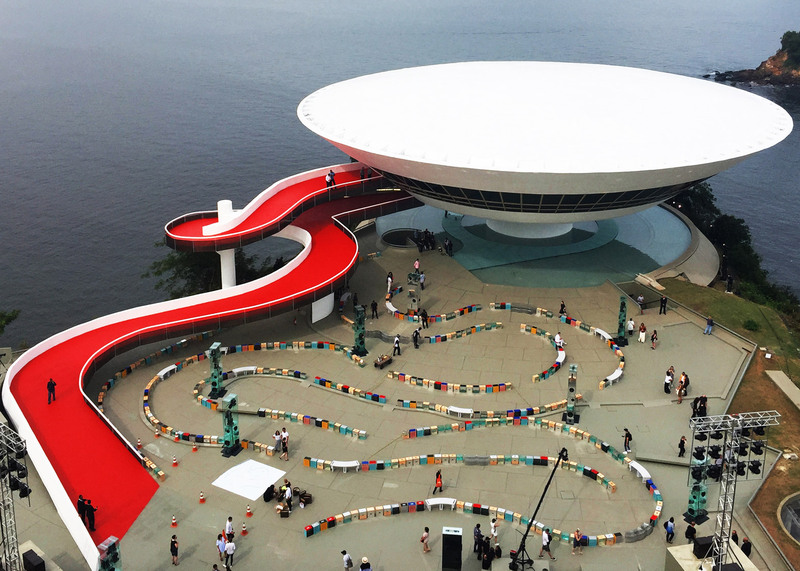 "The coloured collage that we perceive in Rio's present is grafted into the 20-year-old retro-future of Niemeyer's extraordinary sculptural architecture," said Devlin. Completed in 1996, the Museo de Arte Contemporáneo de Niterói is one of Rio's major landmarks and sits at the top of a cliff overlooking the entrance to Guanabara Bay, with views over the water towards the city and Sugarloaf Mountain. The three-storey building was designed by the prolific Modernist architect Oscar Niemeyer, with structural engineer Bruno Contarini, and is shaped like a wide, upside-down cone. The twisting ramp leads to its main hall and a viewing gallery. Niemeyer is best-known for his work on Brasília, Brazil's capital city, where he designed most of the main civic and government buildings, including the Roman Catholic Cathedral that earned him the 1988 Pritzker Architecture Prize. He began working in the 1930s and never retired, working on projects right up until he died in 2012 at the age of 104. Devlin is one of the UK's leading stage designers, with major projects including the London 2012 Olympics closing ceremony and arena tours for Kanye West, Jay Z and Take That. She has been working with Louis Vuitton since 2014.